A huge shame that the old site wasn't handed over to a new moderator. Mind you, I only found out about this site by looking up the old one. 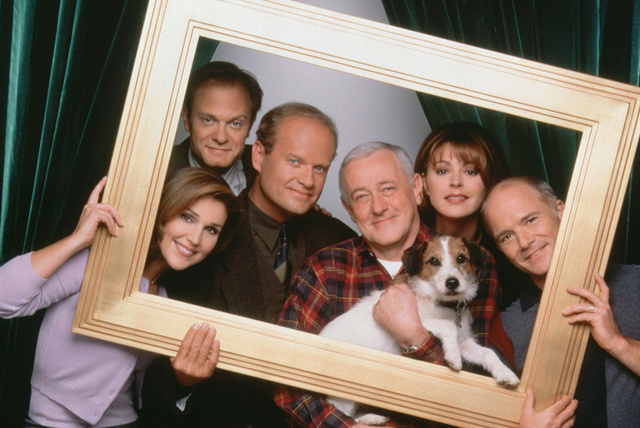 Delighted to be in the company of all of you Frasier lovers! Bing update: number one result for "frasier forums"! Not only are people still around, plenty of us are still watching Frasier. My wife and I were watching Frasier last night. 5 episodes!! One of them was the episode where Donny proposed to Daphne and she accepted. How incredibly moving and sensitive and upsetting and funny (at times) was Niles reaction to that? The scene where Niles arrives at Frasier's apartment with the girlfriend who is the waitress from Cafe Nervosa is a huge example of the quality of performer that David Hyde Pierce is. He is, at that point, in the throws of a bohemian relationship with a much younger woman and his character is "transformed" at this time. Many actors might struggle witht this. Pierce's performance is so subtle and smooth and sensitive....it's incredible. I had to replay it to reassure myself I wasnt exagerating. I love this series.....why wouldn't I? Yes, we're still around. I check in at least once a week if I can, if you have any questions please don't hesitate to Private Message me or email. I just checked in to the old site and found 9 people were there (3 registered and 6 guests). I'm the only person on here right now. I'm not sure I understand it. People are still logging on to read about Frasier just not logging on to here. This new site is great and I commend John for the work he's done/doing. People would rather go to an old and locked site than come to a new one? Comments anyone? Just revisited Frasieronline.co.uk and realised that the six (yes six!) registered users online at that point were bots (An Internet bot, also known as web robot, WWW robot or simply bot, is a software application that runs automated tasks over the Internet) from places like Yahoo, Bing, Google etc. The other 6 users were guests. So.....that accounts for half of the users. Definitely thinking I have too much time on my hands. I should go watch another Frasier episode!! I guess it's because the old forum has so many topics and analyses and people still read those. Also, I guess some of them might be nostalgic, they had quite a community there. That's not to say that we're any less great, but I guess it could help if all of us came round more often and started threads and so on .